Recently, First Presbyterian Church (FPC) had a big and joyful week! For starters, FPC kicked off their Vacation Bible School (VBS). Throughout the week, FPC hosted a VBS for all ages. Each night was started off by dinner, and then the children enjoyed their rotations of games, Bible lesson, music, and crafts. 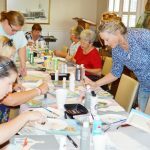 During this time the adults heard from Jason Brewer, Pastor of Mullins Presbyterian Church, on Sunday and even had a craft of their own, led by Mrs. Jane Calhoun, on Monday and Tuesday night. Wednesday night ended their VBS week with a presentation of songs, Bible verses, and more for the children’s parents, grandparents, and friends. Yet, this was just half of what made last week so exciting in the life of FPC. 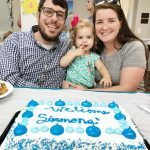 The congregation also welcomed their new Director of Youth and Family Ministries, Mr. Zach Simmons. Zach is married to Megan, and has a little girl named Ruth. Zach is originally from Sumter, SC, but comes to Dillon after serving at churches in Rock Hill, SC and Bartow, FL. He also is currently a student at Reformed Theological Seminary in Charlotte, NC. It has been a great kick-off to the summer months at FPC, and they are expecting many more in the future!